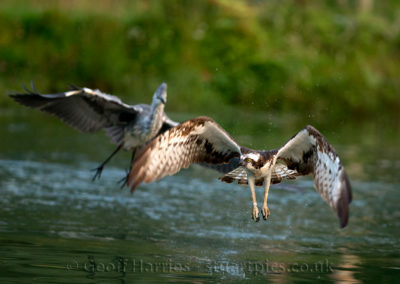 Jamie has asked me to share my knowledge of photographing the ospreys from the Horn Mill photo hide. I have probably spent more time in this hide than any other person and seen so far 6 different birds visiting the site. 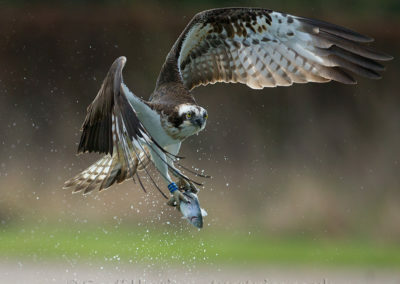 Ospreys in the wild usually succeed in one out of four dives to catch a fish, but due to the large number of fish in this pond the success rate is usually much higher and some older birds seldom fail on their first attempt. The good news is that you have the opportunity of getting the image of the osprey leaving the pond with a fish. The bad news is that you are limited to one go before the bird flys away with food for his family and may only return much later in the day. 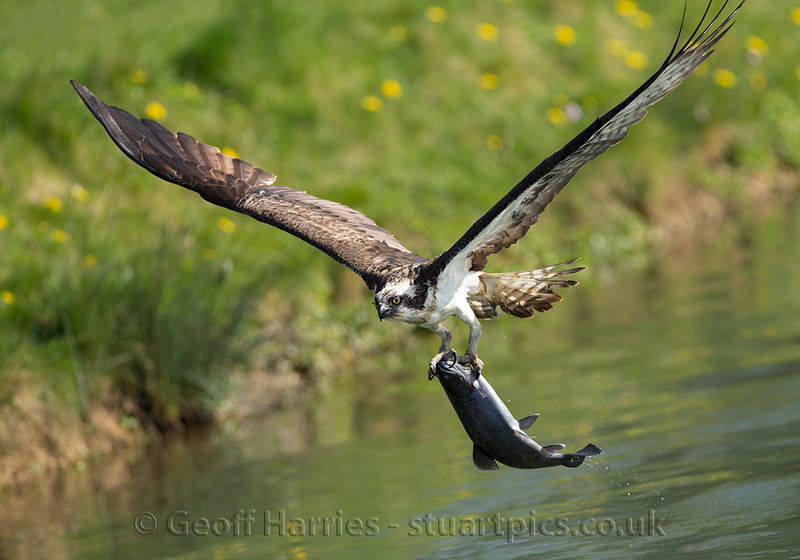 So how do we maximise our chances of getting the “killer” shot of an osprey flying off with a fish in its claws? 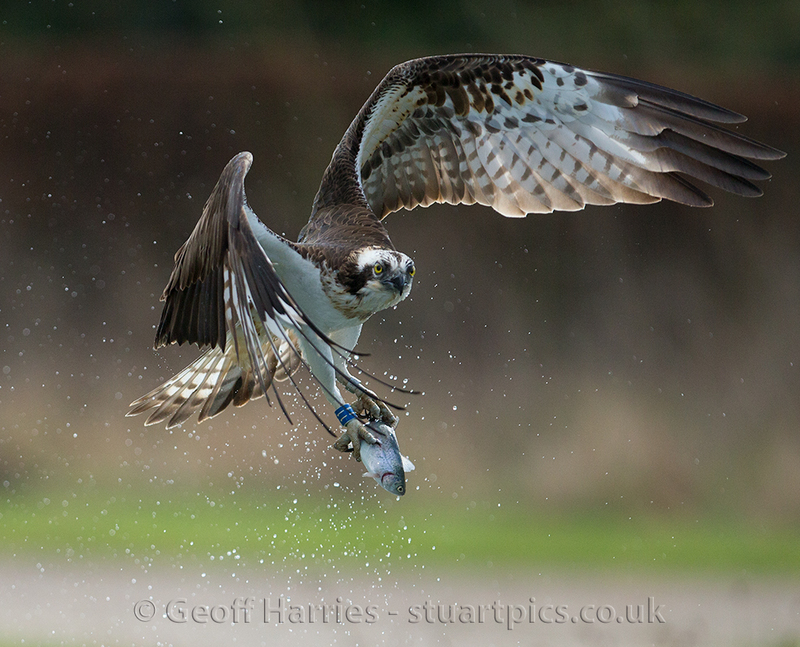 I can give the following advice based on my own experience in this hide and successfully capturing nearly 1000 osprey images. 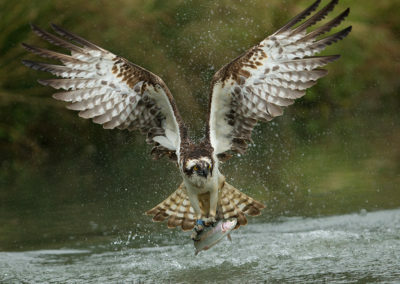 However your ultimate success will be down to you and the osprey. This needs to be no greater than 300mm; on a cropped sensor camera this must take account of the crop factor i.e. 1.6 crop gives maximum 200mm lens possibly use 70-200 or 100-400. 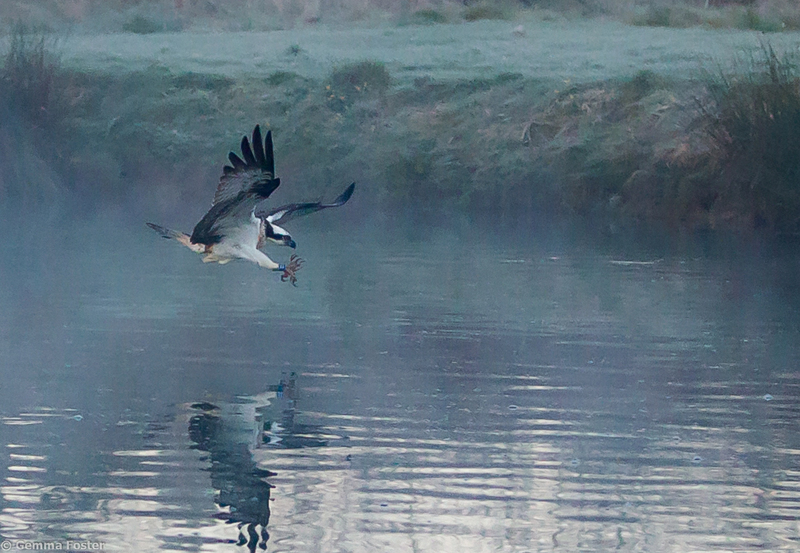 Bring your fastest lens, you will be shooting a bird in flight in mainly low light. 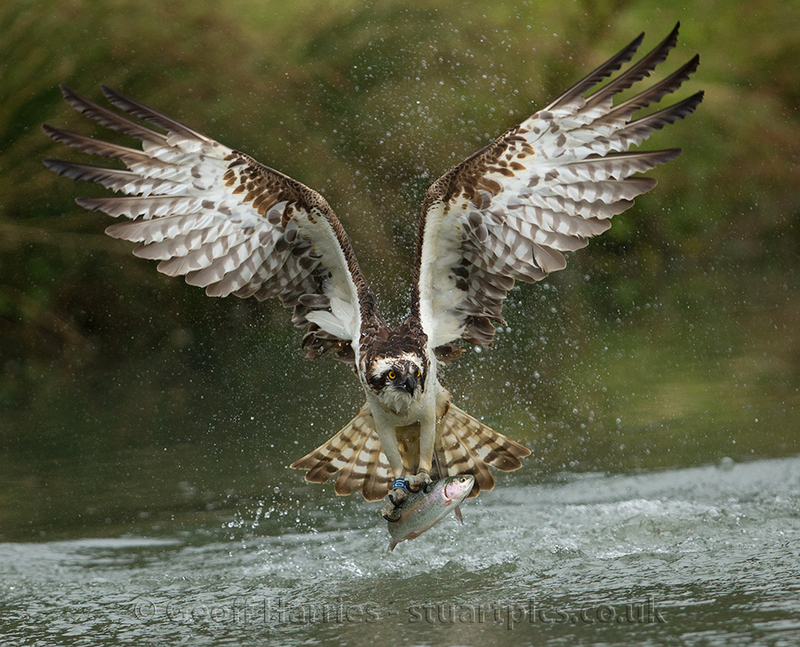 The osprey can dive and catch a fish and fly away in 8 to10 seconds in low light. Ideally use an SLR set up with AI servo at fastest frame rate. 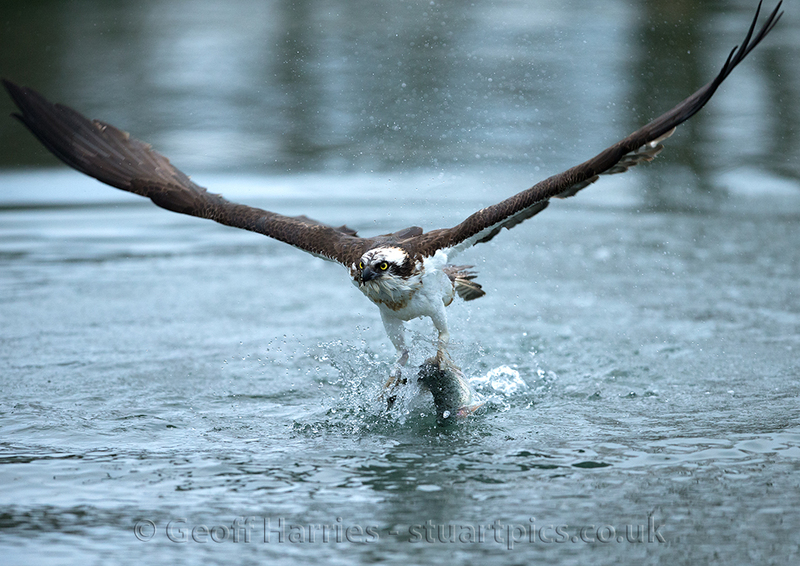 The ISO setting will depend on light conditions, but with early and late osprey fishing, be prepared to increase ISO up to 5000. Minimum speed needed to get a reasonable image is 800th, ideal speed is 3200th. Have a fully charged bat-tery installed and an empty formatted memory card. Set-up quickly when arriving at the hide, don’t forget to turn on your camera and check settings. While waiting for the osprey to arrive take some test shots of the green shuttering at back of pool, remember speed needs to be at least 800th. Set camera exposure compensation to -1/3 to -1 stop, this will give you more speed and avoid blowing out detail in the white feathers of the osprey. If possible use RAW image camera setting, this allows greater post-processing of high ISO images. 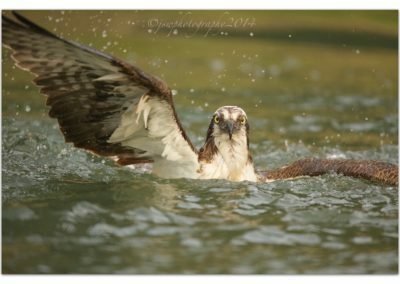 Remember you will usually only have 8-10 seconds to get your shots of the osprey, so keep alert and don’t get involved in distracting conversations or your visit and money will be wasted. Keep checking camera settings, as the light improves start reducing ISO while maintaining speed. Remember that this is a wild bird and is unpredictable, timing can vary enor-mously so be prepared to have to wait, but keep alert at all times. If the bird misses the fish or pulls out of the dive, chances are it will keep returning to try again, so stay in the hide and wait. 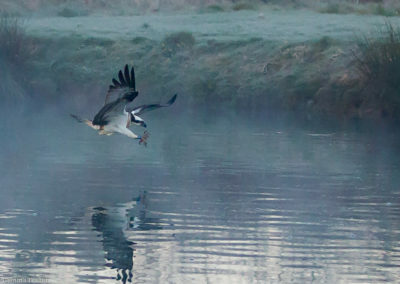 Recently there has been 2 or 3 different birds fishing in the morning so be ready for the next bird visiting which may come from a different direction. This is an exciting exhausting experience leaving most people saying “wow”, so be prepared for the special moment when an osprey dives in to the water only a few metres away and flys off with a fish in its claws.